snowdeal.org > ex machina: carotene and xanthophyll wish chlorophyll a vibrant goodbye. carotene and xanthophyll wish chlorophyll a vibrant goodbye. 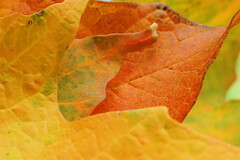 autumn orange comes from carotene and yellow from xanthophyll, which is itself derived from carotene. both become visible when chlorophyll stops being produced by the tree as it prepares itself to preserve water during the winter months.